Tell us a little about Charlie? Charlie is in the 4th grade and electronics projects are definitely one of his special interests! He also enjoys Nerf gun wars with his friends, graphic novels, computers, Roblox, Minecraft, Fortnite, and watching extreme science videos on YouTube. When did you introduce electronic projects? We encouraged Charlie and his younger sister, Fiona, to experiment with simple circuits — a battery, a light, and some wires– when they were about 4 or 5. It is super fun to build a simple circuit with kids and have them touch the wires to different materials to see if the light bulb lights up! They can run around the room and test all kinds of materials and you can make it into a game to see if they can figure out any pattern. Tell us about your PocketBeagle® experience? 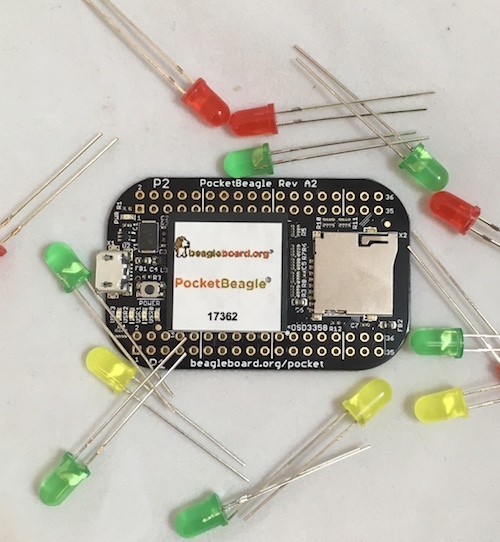 What made PocketBeagle® appealing to Charlie was it’s size, portability, and the ease of powering it from 4 AA batteries. When we got home with it, Charlie and I went searching for good projects to try and discovered the Halloween Pumpkin Project. It was his first project using transistors so that was great learning! We substituted the beagle for a bat that flaps its wings and blinks its eyes. Since we were able to power PocketBeagle® from AA batteries, we had the pumpkin outside on our steps during Halloween, which gave Charlie the opportunity to talk to other kids about it. I also used the project as an opportunity to introduce Charlie to object oriented programming. We work together to create a Circuit class that wrapped the basic I/O pin control so that we could easily port the program between a Raspberry Pi and the PocketBeagle (for headless operation). Then we built a Wing class out of two circuit objects (wing up circuit and wing down) and then Charlie was able on his own to create a Wings class (with two wing objects) that had a “flap” method as well as on and off methods. He was very excited and it was super fun. 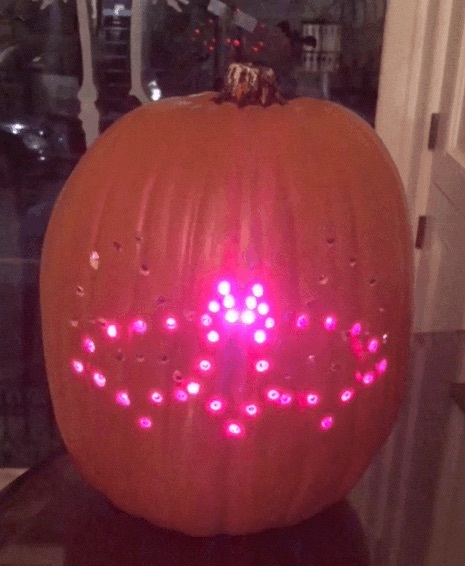 We enjoyed the whole project very much, from drilling the holes in the pumpkin to soldering the LEDs into long chains, and programming the PocketBeagle®, although it took a bit longer than either of us were anticipating. I think we spent around 15 hours all in all. We did it over 2-3 weeks in 1-2 hour chunks. What’s next for your PocketBeagle®? We haven’t take advantage of its full capabilities, obviously, and as soon as I have some free time I am thinking of learning more about the PRUs. Charlie is really interested in RC cars and so I am wondering if I could find or design a project appropriate for him using the PocketBeagle and an RC car. What other projects have you used to develop coding and electronics skills? So many things! While we love Snap Circuit kits and Little Bits, we found that for very little kids those kits hide the basic foundational concepts of electric circuits. So we started with some components we bought at Radio Shack that pretty much looked like this. Pretty early on we also built some batteries. Charlie went through a HUGE Snap Circuits phase from age 5-7 or so and still likes them (as does his little sister). He also loves Lego Technics as well as Mindstorms. We also have a collection of Little Bits that both kids enjoy. gpiozero library. He learned some basic programming concepts from Codemonkey (which we found via a tip from some friends at Brooklyn Lab) and then I worked with him on some early Python programs. Since then he has been writing simple programs for the Pi to make traffic lights and other various circuits using pushbuttons, LEDs, relays, and resistors. What advice do you have for other parents to encourage young developers? I would say that no one is ever too old or too young to start experimenting with electronics and computing. We avoided expensive kits or experiments early and kept it really simple. A couple of wires, a battery holder, and some light bulbs presented in the right way can really pique a kid’s curiosity about electricity and circuits. Being able to control electricity is a lot like magic and can be presented that way — only it turns out the secrets can be unlocked by a kid! Once the kids were hooked we built up to more advanced kits or projects that can do more things, following our kids’ interests. I think it really helps to have a grownup (or a bigger kid) who is passionate about science, electronics, and computers helping to select projects and guide kids in their work. That can be a parent, a teacher, or folks at a neighborhood after school program focused on science & technology. Educators, Check out our PocketBeagles® for Education promotion to receive free boards for your classroom.